Randi from Samana Wellness posted the image below (originally from Just Smileology on Tumblr) yesterday and it resonated with that perpetual need to overcome self-doubt. On a beautiful sunny day, when the weather feels supremely confident, it feels very appropriate. 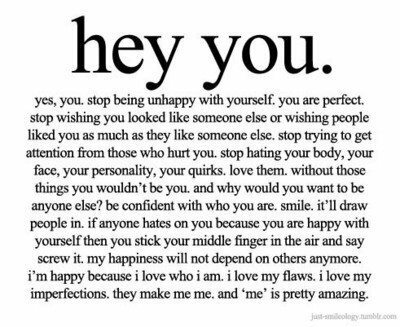 Stop being unhappy with yourself. You are perfect. Stop hating your body, your face, your personality, your quirks. Love them. Without those things you wouldn’t be you. And why would you want to be anyone else? Smile. It’ll draw people in. My happiness will not depend on others anymore. I’m happy because I love who I am. I love my flaws. I love my imperfections. They make me ‘me.’ And ‘me’ is pretty amazing. Here’s hoping that everyone finds that amazing confidence to love themselves just the way they are!